Spokesman of the LNA Monday on Twitter said the Sharara oilfield in the southern Libyan desert, which produces a third of Libya’s 1 million barrel per day, is now under the control of the army, led by Field Marshall Khalifa Haftar. The LNA last month launched an offensive on the south to flash out terror group, it said. 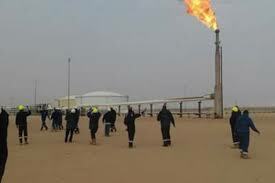 “Peacefully with no resistance, LNA has full control over Sharara oilfield with all its facilities,” the spokesman said. The LNA fighters in pictures posted by the army were jubilating in front of one of the oilfield signposts, Reuters reports. Hours earlier, Reuters was told the army was negotiating access to the field. The Haftar-led army last Wednesday said it seized the field after taking control of a remote pumping station. The claim was quickly refuted by armed groups that stormed the oil installation in December over demands for better living conditions. The GNA, which normally controls the field, sent, in response to the LNA’s conquest, forces led by commander Ali Kennah to secure the field but the attempt failed, Reuters notes. Production at the Sharara oilfield is on hold. Tripoli-based-National Oil Corporation (NOC), the sole Libyan oil exporter and producer issued force majeure noting that the production will not resume until its own guards take control of the facility.